Surprising resilience of Bitcoin over the weekend. There was a somewhat scary and concerning moment when Bitcoin crossed below its long-term downtrend line, but it was promptly bought up and is again above that line. That is a very bullish indication that really did a number to the shorts on Bitfinex. That move was both a test to see how many weak hands were left in the market and also a possible short trap. I’m cautious though at this current level. I would really like to see some higher prices beyond the 9200 value are. But let’s see this bullish forecast. There is a Gartley pattern that has formed and completed at this current price level. It’s a bullish shark and indicates that we should see higher prices. This also coincides with a 1-2-3-4-5 Elliot Wave (a Motive Wave), specifically with the beginning of a third leg up. This channel we are observing could/should hold as a support zone for higher prices. 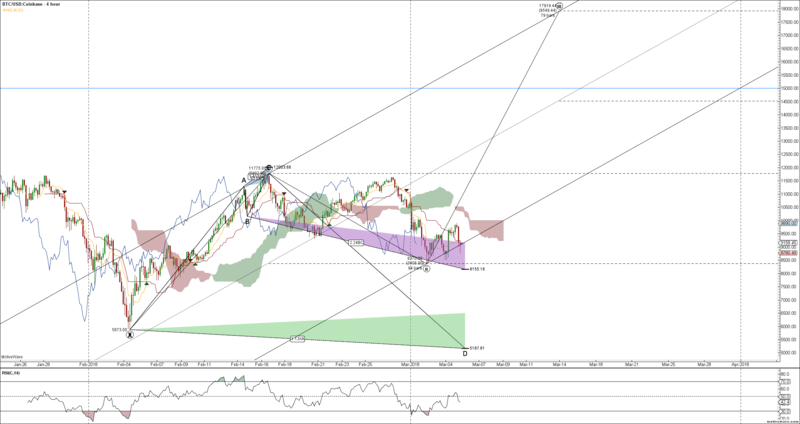 The RSI on this chart shows us below the mid-level, which is supportive for higher prices on the 4 hours. On the daily, we are oversold on the CMI and relatively neutral on the RSI. I am not sure why the dates are off on my chart, but the target high zone of 17,919.4 is on March 23rd. Now, that is a very extended level to reach between now and 10 days from now. Is it possible? Sure. Probable? Not likely. But the direction is very likely. But we do need to be cautious of further breakdowns in price. Unless some strong supportive volume breaks Bitcoin above the $10,000 value area again, we could see much lower prices.